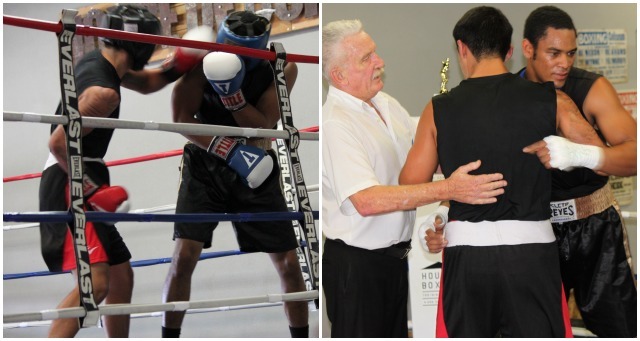 Here we see Friday’s pre-fight preparations: On Saturday, October 18th, the House of Boxing hosted the latest USA Amateur Boxing Show and it was a classic. Such success has become routine. Things always seem to run smoothly at San Diego’s House of Boxing whether it’s a Golden Boy Press Conference or a top contender’s workout. How quickly the House of Boxing has matured to become your archetypal, old school boxing gym, an ideal venue for shows complete with just the right amount of background music, seating arrangements, delicious food, and competitive matches pitting the brawler against the right finesse boxer to maximize the viewers’ enjoyment. 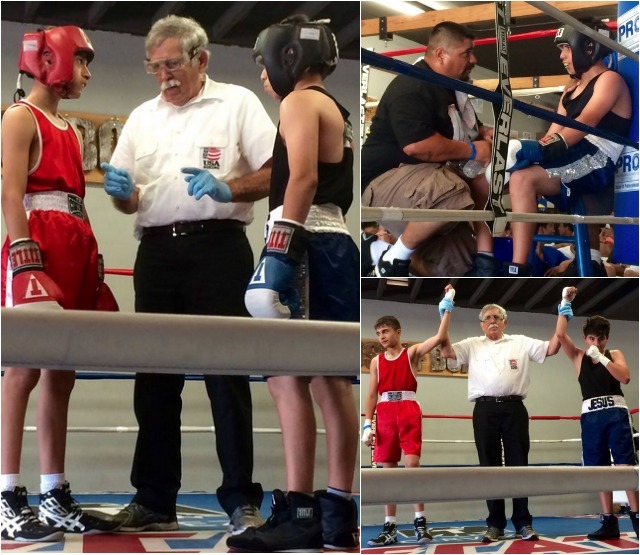 In Bout #1, it was 13 year-old Jose Chollet (15-4, 100 pounds) of Barrio Station facing 13 year-old Jesus Segura from the Lincoln Boxing Team of Riverside, CA. 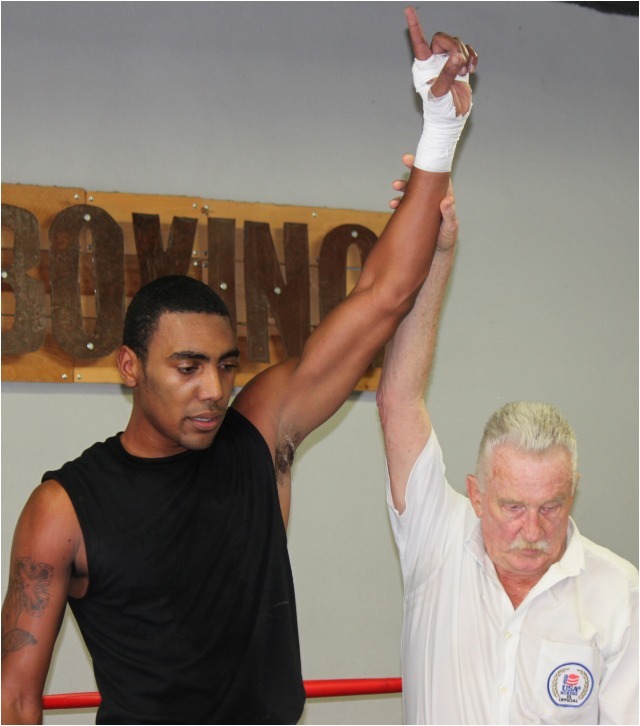 In Round #1, Chollet, still smarting after his loss last week to Felix Soria of Fontana, CA, had everything working. His punches were straighter and he had more power behind each to help him build up a comfortable lead. As the bout progressed, Segura’s confidence grew and he did do better but still not enough to match Chollet’s point output. 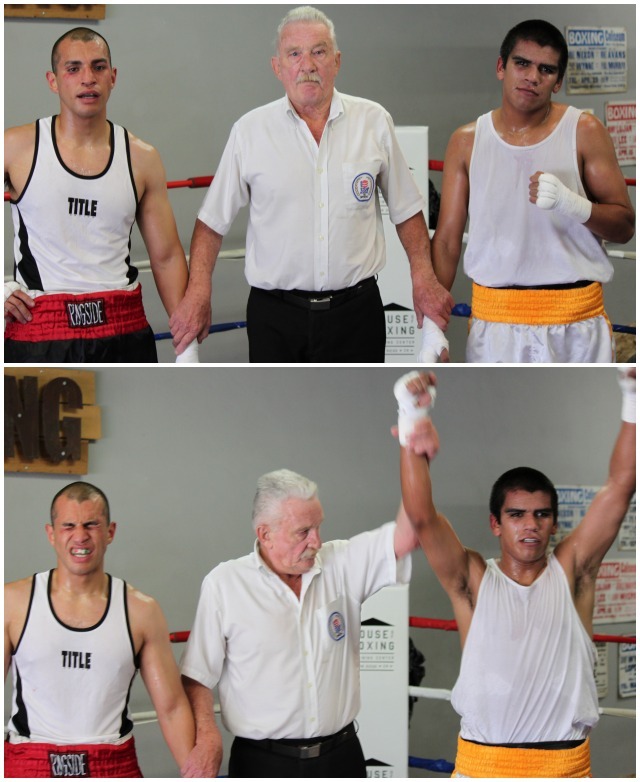 (photo right) Combatants in Bout #1, Jose Chollet (l) and Jose Segura (r) meet in the center of the ring with referee Will White to go over the rules. 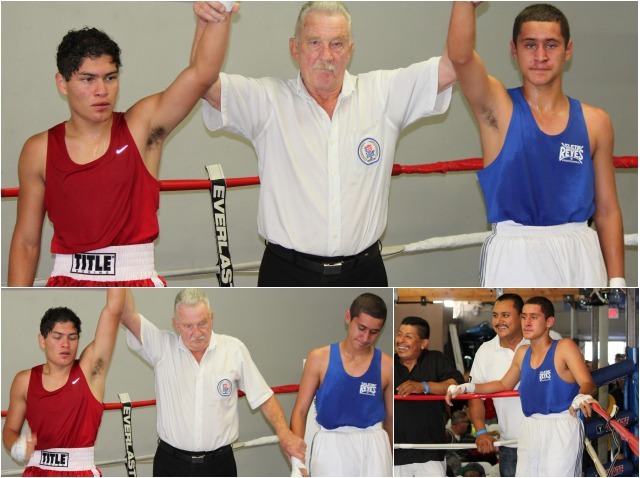 In Bout #2, it was 16 year-old Ulises Bastida of the National City CYAC going up against 15 year-old, Daniel Castellanos of the Alliance Training Center in Chula Vista, CA. In this evenly matched bout, there was your usual give and take, but after awhile it was clear Bastida’s punches, which at times landed in bunches, landed cleaner and with more authority. Regarding the bout’s intensity: twice, referee Will White had to stop the action and issue both boxers a standing 8-count. 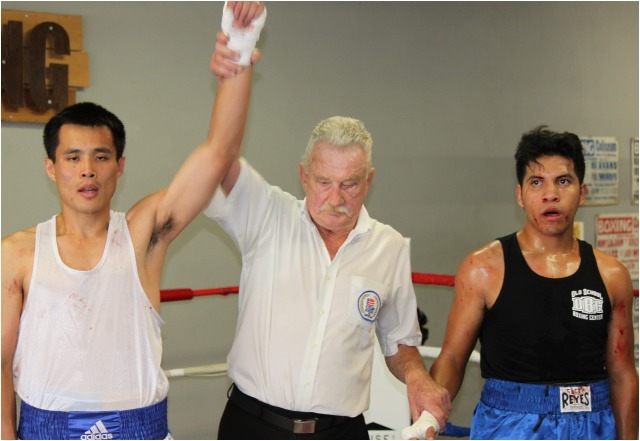 (top) At the conclusion of Bout #2, Ulises Bastida (l), had his arm raised in victory by referee Will White after gaining the decision win over Daniel Castellanos (r). 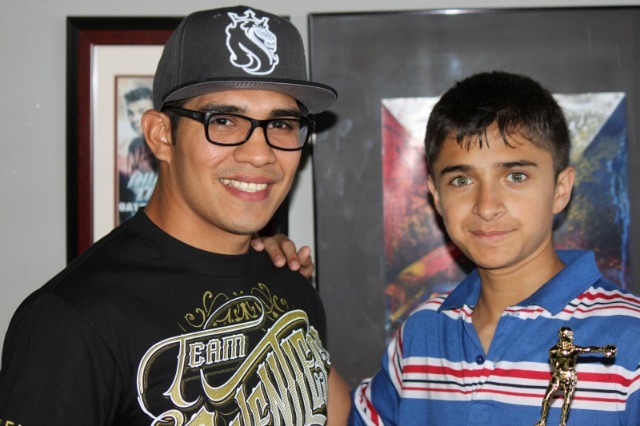 In Bout #3, it was 14 year-old Giovanny Rodriguez of the host gym, The House of Boxing, going up against 14 year-old Jonathan Coronado of the UFC Gym in San Marcos, California. Despite the boxers being the same age, you had to figure Rodriguez had more training since the UFC Gym has only been in existence for, at the most, two years. Perhaps sensing this in his footwork, Rodriguez wasted little time and went nonstop at Coronado as if they had a long list of grievances. As a result of Rodriguez’s onslaught of punches, Coronado was issued an 8-count in round one and two more in round two which prompted referee White to call a halt to the contest. 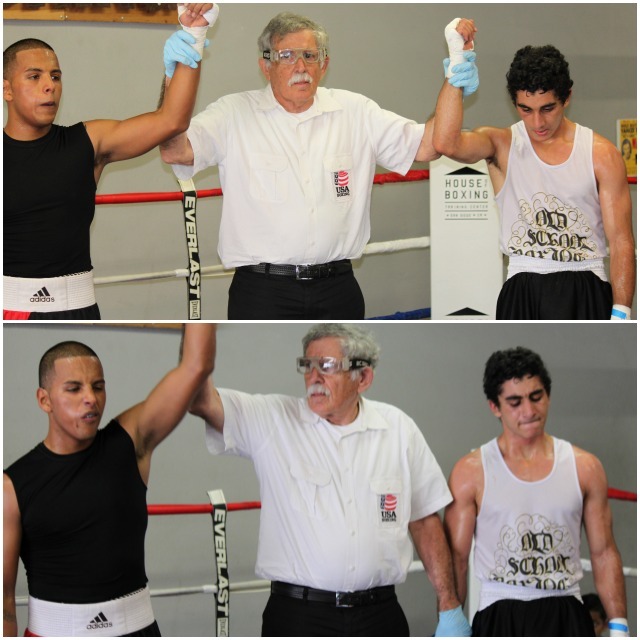 At the conclusion of Bout #3, Giovanny Rodriguez (l) of the House of Boxing, who defeated Jonathan Coronado (r) had his arm raised in victory by ref Will White. 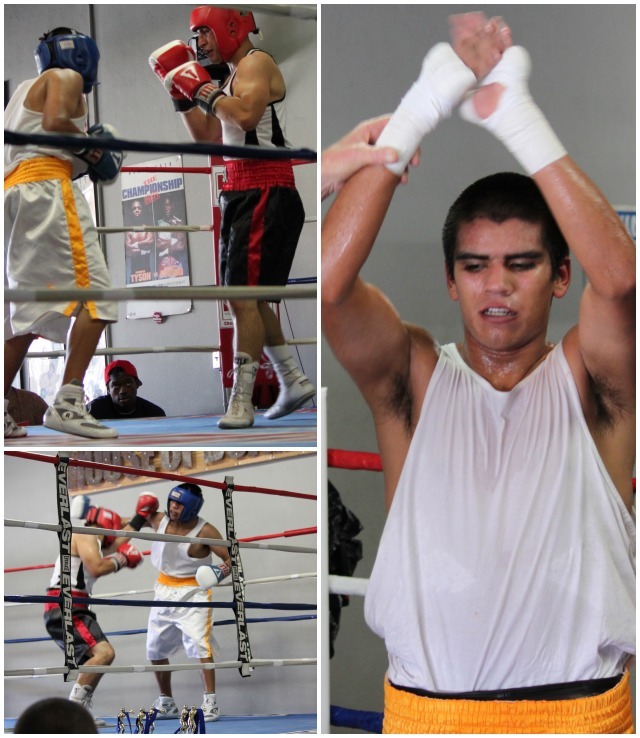 Bout #4 featured a battle between 24 year-old Johnathan Espino of North County Boxing and 25 year-old Joshua Rivera of the Tiger Smalls Boxing Team out of the San Diego Combat Academy located in Mission Valley. At the close of round one, after the majority of the fighting had been done in close quarters, it appeared Rivera had the point lead by virtue of landing more of the cleaner, power shots, especially to the head. By round two, the match had evolved into these momentum swings, periods where one boxer would land four straight and then his counterpart would return fire trying to match or surpass his opponent’s output. By the close of round three, with both boxers beginning to tire, it appeared Rivera had been the more productive of the two. 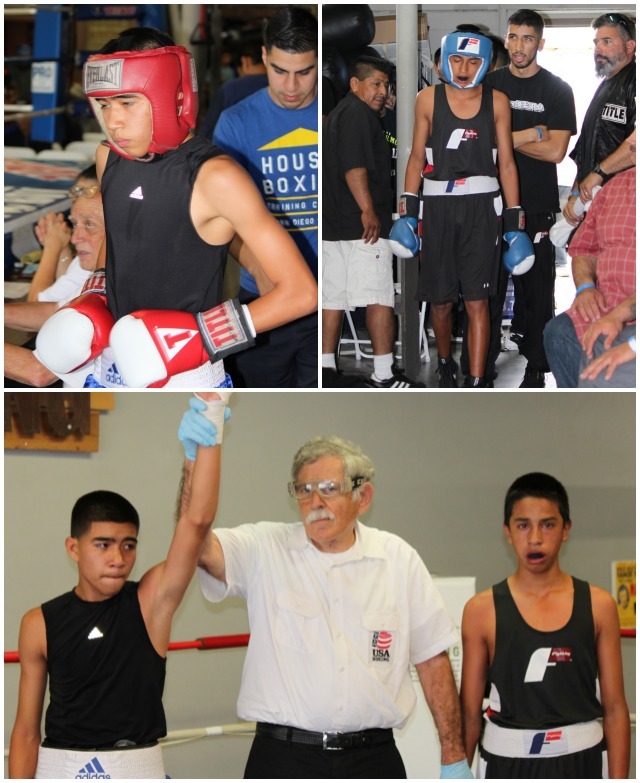 In Bout #5, it was 15 year-old Paul Wilson from the Legacy Training Center, Vista, going up against 15 year-old Jovanni Gonzalez of the Pinzon Boxing Club, Escondido, CA. In round one, with Wilson starting quickly and appearing to have the match well in hand, he suddenly got careless and Gonzalez took advantage. After Gonzalez landed three unanswered blows to the head, it was Wilson, not Gonzalez being issued an 8-count. Despite the 8-count, you still figured the judges had Wilson ahead on their scoring. In Round #2, Gonzalez looked even more impressive after using both his longer reach and better leverage to land the heavy power shots. Still, it was Wilson and his cunning that had him racking up the most points. First, he’d hit Gonzalez with a single blow or a two punch combination, then he’d immediately tie him up. 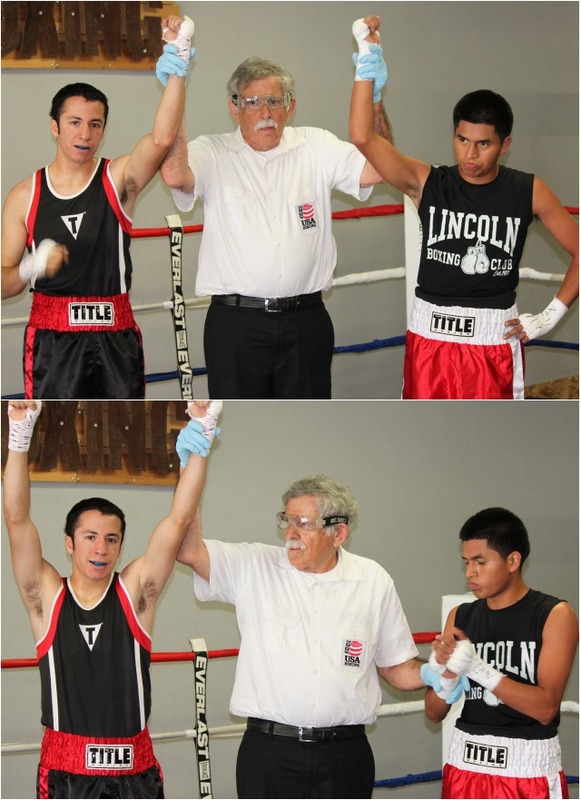 One such combination had referee Rick Ley issuing Gonzalez an 8-count. Round #3’s free-for-all was the most contentious of the bout. 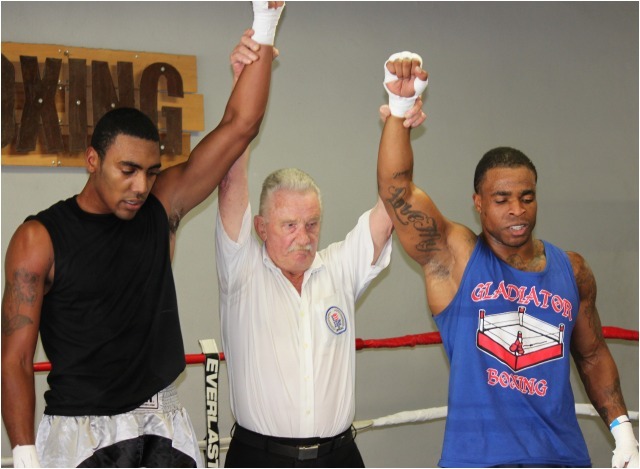 In the end, it was Wilson being awarded an unanimous decision victory. 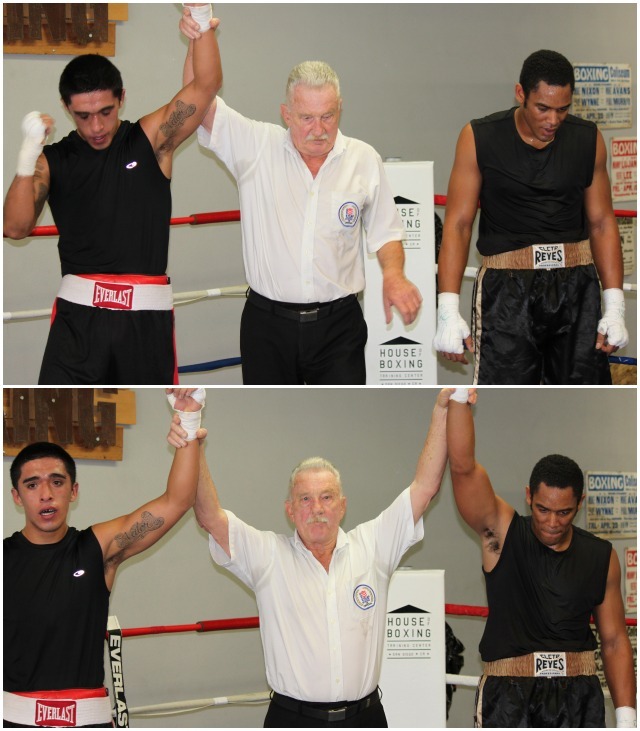 (bottom, left) In Bout #5, it was Paul Wilson (l) of the Legacy Training Center, Vista, getting the win over Jovanni Gonzalez (r) of the Pinzon Boxing Club, Escondido. In round one, the punches came at the rivals like cannon fire; the kind of punches that have such accuracy you fear one will soon knock someone’s head off. After witnessing the number of times Jimenez had his head snap back, you’d have to agree Christopher took round one. With the give and take being quite even in round two, Jimenez may have stolen that round by delivering three, very hard, unanswered blows in the closing seconds. Like the second round, the final round went to Jimenez who clearly had more gas in the tank. With Christopher tiring, Jimenez appeared ready to go even further. 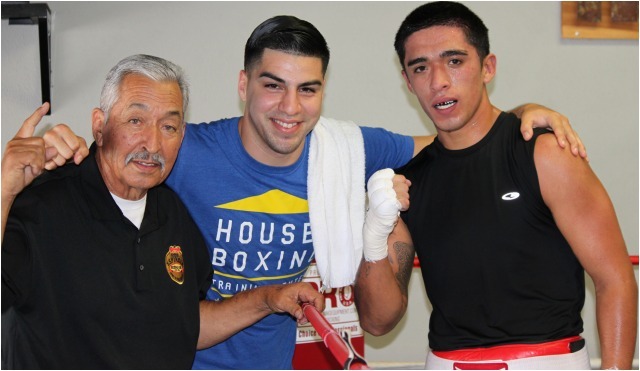 Bout #6 featured 19 year-old Christian Jimenez of the House of Boxing shown here with his coaches Carlos Barragan, Sr. and David Barragan. 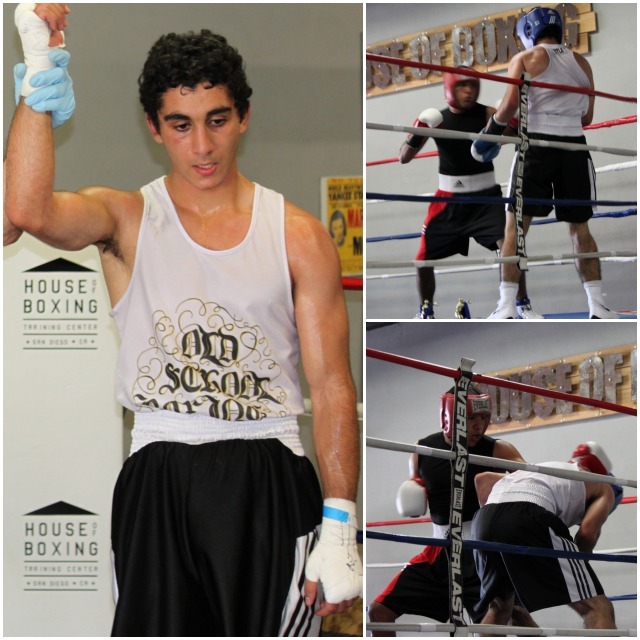 In Bout #7, it was 23 year-old Armando Tovar from the House of Boxing going up against 18 year-old Ali Fakhreddine of Old School Boxing & Martial Arts near the campus of San Diego State University. In round one, Fakhreddine looked impressive as he skirted about the perimeter of the ring, eluding, dodging and slipping a ton of punches, while on occasion stopping to deliver more than a few stinging jabs and two-punch combinations. Slowly but surely, the rabbit slowed and Tovar began to cut off the ring to land his punches, enough punches to slowly but surely win over the judges. 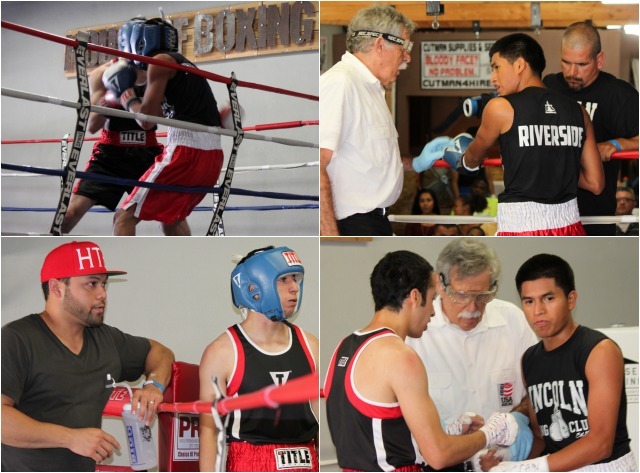 Bout #8 had 22 year-old Kevin Salas of The Home Team training out of La Mirada Community Center in South San Diego going up against 20 year-old Jesus Pinzon of Lincoln Boxing, Riverside, CA. Like Rodriguez in Bout #3, Salas’ plan involved bull rushing his opponent to have the match end early. After Pinzon was issued three straight 8-counts, referee Will White was quick to pull the plug, declaring Salas the winner by TKO in what may have been the quickest stoppage of the show. It was over before he had a chance to get started. 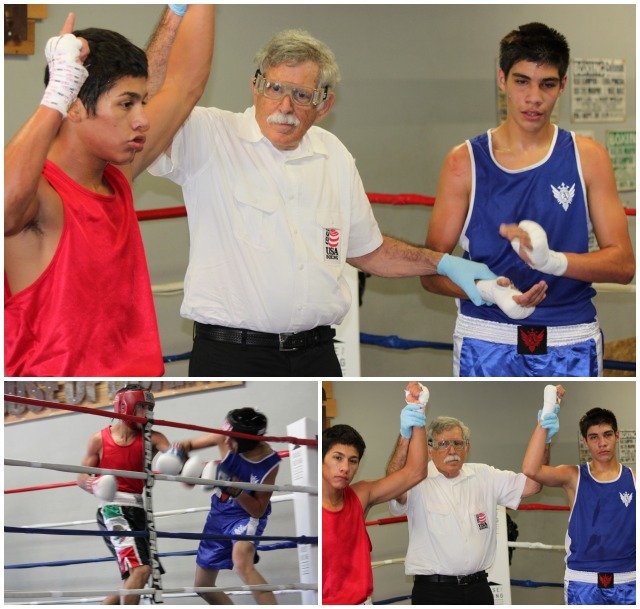 On Saturday, Jesus Pinon (r) felt he had been a victim of an early referee stoppage. Others felt the referee had done him a favor to save him for another day. 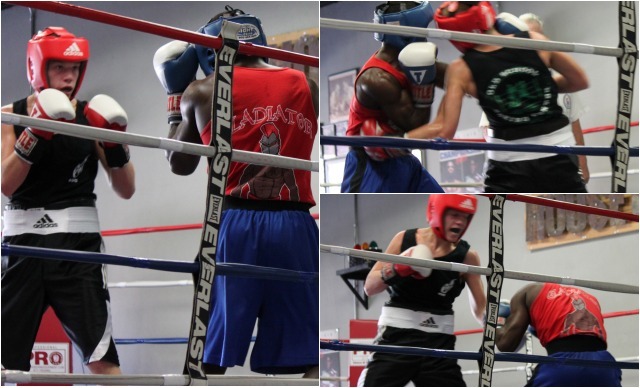 Bout #9 was a rematch between 18 year-old Tyler Herberger of Old School Boxing and 25 year-old Contravis Christopher of the Gladiator School of Boxing, Spring Valley, CA who fought last week at the Bound Boxing Show in Chula Vista. Throughout the match, Strozier (who lost last week) seemed content to stand there in front of Herberger and swap leather. In rounds one through three, it was Herberger landing more punches and more of the harder garden variety to make this an easy call for the USA Judges. In Bout #9, it was the rematch between Tyler Herberger (red headgear) and the shorter Contravis Christopher (in blue headgear). 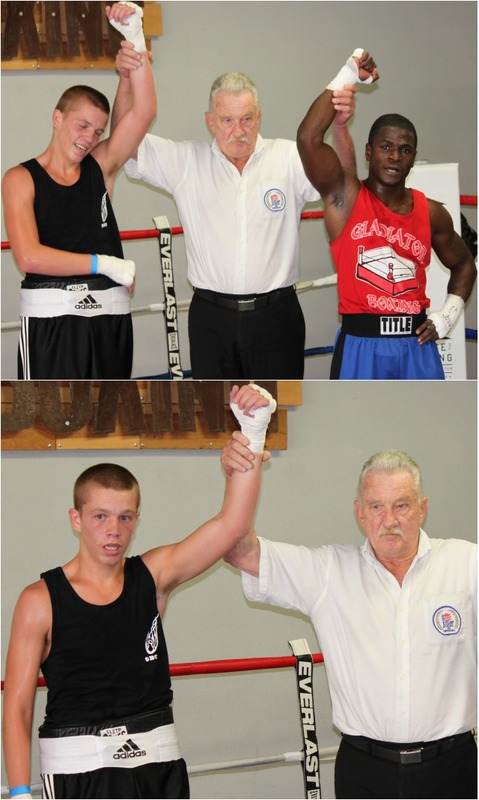 For the second straight week, Tyler Herberger (l) of Old School Boxing defeats the persistent Contravis Christopher of the Gladiator School of Boxing. 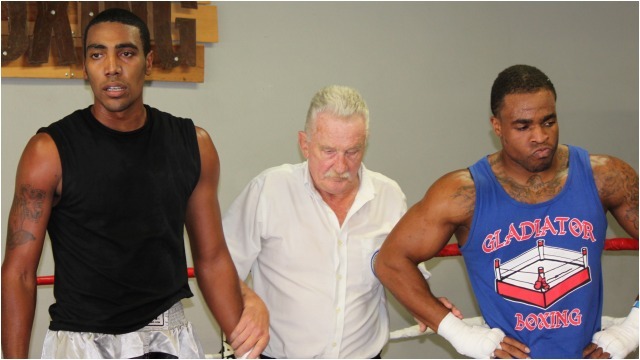 Bout #10 featured the big boys, a duel between the 22 year-old, 6’4” Xavion Betts (2-0) coming 150 miles south from Victorville, CA (a 2 hour and 20 minute drive) to face 24 year-old Jessie Okeke (1-1) of the Gladiator School of Boxing in nearby Spring Valley, CA. You talk about your brave souls, after the long drive, Betts discovers Okeke has the build of a Mr. Universe. Does he turn tale and run? No! Instead, he thoroughly outboxes the stronger Okeke. Okeke was issued an 8-count in round one, followed by an 8-count in round two, after the unanswered punches kept mounting up. 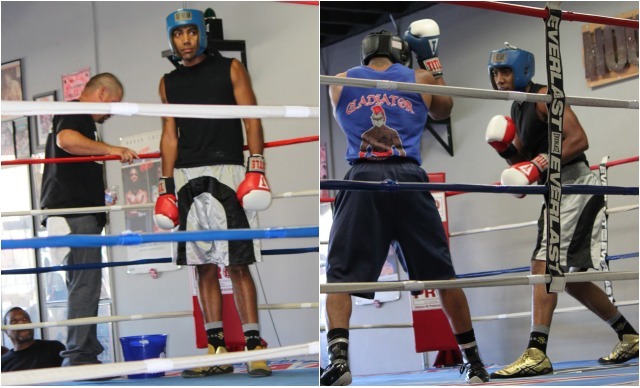 (left) Awaiting the start of his battle against the rugged Jessie Okeke, Xavion Betts of Victorville, CA (red gloves) looks across pondering his strategy. 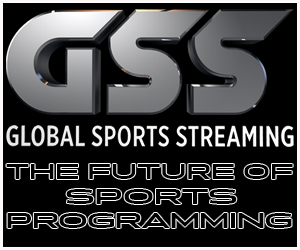 An interested party in attendance for this match was pro-boxer, heavyweight Rafael Rios (1-1) of the host gym. Can you answer the following trivia? Aside from Mr. Betts, can you name two, ultra famous people who called Victorville, CA their home? Actor Cuba “Show me the money” Gooding, Jr. is from Victorville. Also, Roy Rogers, the King of the Cowboys, owned this 67-acre ranch and museum on the Double R Ranch just outside of town in the Mojave Desert. Roy Rodgers and Dale Evans’ property included a 1,700-square-foot home, red barn, stable with 15 stalls, half-mile horse track and a fenced in pasture. His sidekick Gabby Hayes was a frequent visitor. 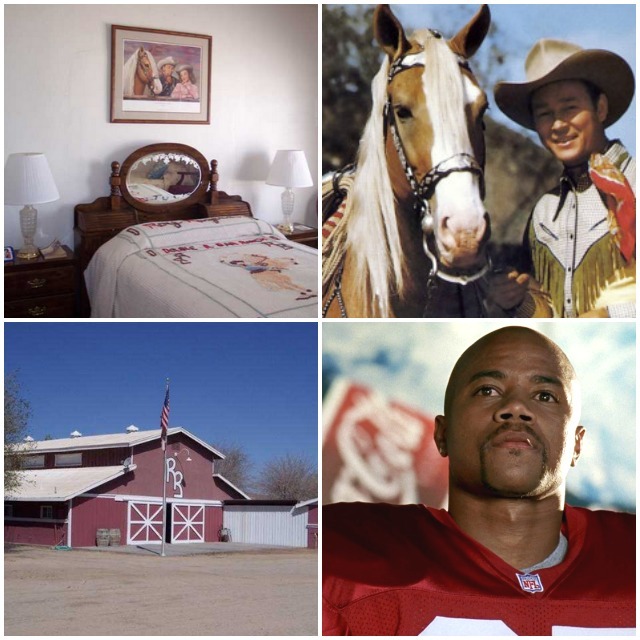 Photos above (left to right, top to bottom) show Roy Roger’s bedroom, Roy with his trusty horse Trigger, the big red barn stables and finally Cuba “Show me the money” Gooding Jr. who grew up in town where the population has reached 120,000. 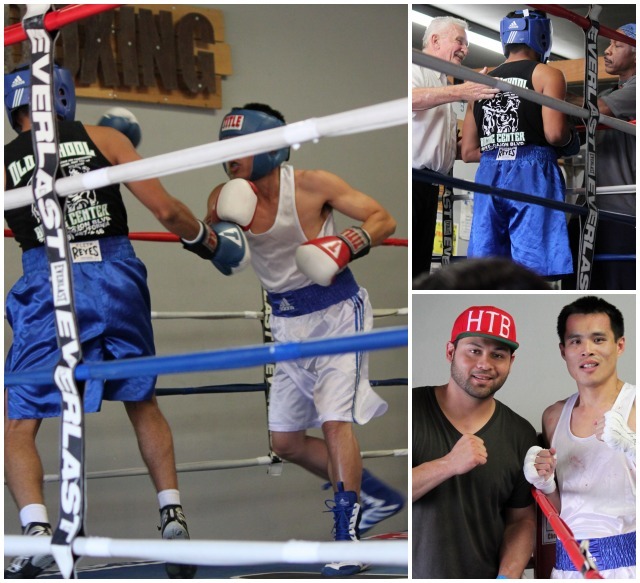 Bout #11, the final bout of the show, saw the return of 31 year-old Tin Bui (1-1) of the Art of Eight Training Center, Kearny Mesa, a San Diego neighborhood, going up against 24 year-old Ivan Sanchez of Old School Boxing. 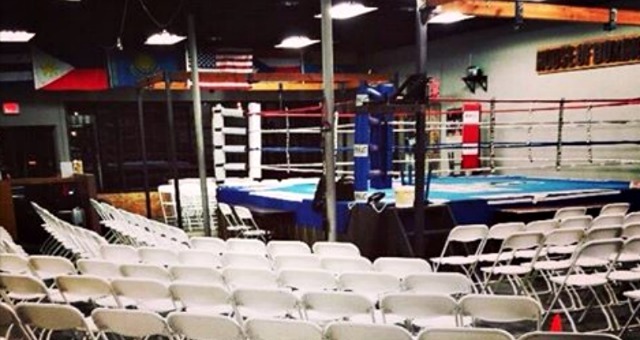 It was almost a year ago, November 9, 2013 to be exact, that Bui fought and lost an ultra-close match to Jorge Andres Rivera of North County Boxing in this same gym. He felt he had that fight in his grasps and let it slip away. On Saturday he wanted to make certain there was no repeat of that dreadful incident. So, midway through round two, after he had Sanchez bleeding from the nose, he went all out to earn the stoppage. It was during this time, that referee Rick Ley stopped the bout twice for the fight doctor to have a look see. After the doctor gave the first advisory that the bout could continue, Bui went even harder to finish Sanchez, which he did before the close of the round. 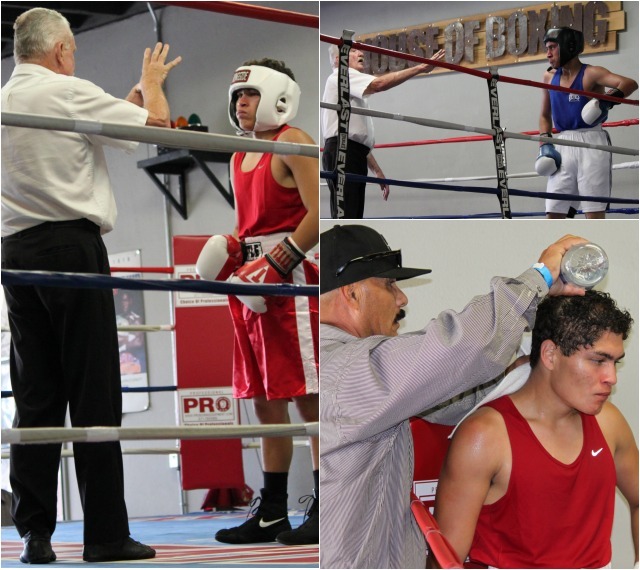 Saturday, October 25th, the USA Amateur Boxing Officials will be at the Pride of San Diego Boxing Gym, 4130 Bonita Road, Bonita, CA 91902. The owner/operators are scheduled to host a show with performances by Kumbia Machine, Lotus, Smokey LOCO and MZ. 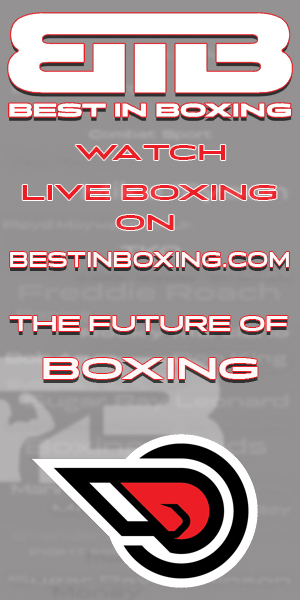 Lovely starting at 3 p.m. followed by boxing exhibition beginning at 5 p.m.